1. Tamarix Linn., Sp. Pl. 270. 1753. Gen. Pl. ed. 5:131. 1754; Ehrenberg in Linnaea 2:241-344. 1827; DC., Prodr. 3:95. 1828; Bunge, Tentamen 1-85. 1852; Boiss., Fl.Or. 1763. 1867; Benth. & Hook.f., Gen. Pl. 1:159. 1867; Dyer in Hook.f., Fl.Brit.Ind. 1:248. 1874; Parker, For. Fl. Punj. Del. Haz.24. 1918; Cooke, Fl. Pres. Bomb. 1:74. 1958 (rep. ed. ); Talbot, For. Fl. Bomb. Sind. 1:84. 1911; Gorshkova in Shishkin & Bobrov, Fl. U.R.S.S. 15:290. 1949; Baum, Monog. Genus Tamarix 22. 1966; Hutch., Gen. Fl. Pl. 2:323. 1967. Shrubs or trees, 2-10 (-12) m tall, with a deep root system, densely branched, glabrous, papillose or subpapillose, bark of various colours, mostly brownish to balckish brown. Leaves small, 0.5-7 mm long, scale-like, alternate, sessile, amplexicaul, vaginate or auriculate, glabrous or pilose, covered with punctate salt secreting glands. Inflorescence simple or compound racemes or panicles, 1-15 cm long, on younger and older branches. Flowers small, penta or tetramerous, mostly bisexual, rarely unisexual, then plants dioecious, each flower is usually substended by one bract, occasionally by two or more, bract ovate, triangulate, or linear amplexicaul or subamplexicaul, herbaceous. or diaphanous, entire or denticulate, acute or obtuse, shorter than, equal or longer than pedicel. Calyx 4 or 5-lobed, subequal or equal with imbricate aestivation, 2 outer, 3 inner (pantamerous) or 2 outer, 2 inner (tetramerous), denticulate or entire, obtuse or acute, various shaped, mostly ovate or orbicular, glabrous or slightly papillose. Petals 4 or 5, free, ovate, oblong, obovate or elliptical, obtuse, slightly notched or somewhat cuneate at the apex, equi or inequilateral, pink, violet, purple or white, deciduous or persistent. Stamens 4-10 (-12) diplostemonous or haplostemonous, antisepalous stamens usually slightly larger than antipetalous stamens, inserted on or below the nectiferous disc. Disc various shaped, anthers ovoid, apiculate or obtuse. Stigmas 3-4, rarely 5 or 2, elongate, clavate or divergent, 2-3-times shorter than the ovary. Ovary pyramidal or bottle shaped, placentas very short at the base of the locules. Capsule, 3-5-engled, conical or pyramidal, dehiscing by 3 valves, downward to base. Seeds small, compressed, glabrous, hairy from the apex, coma sessile. A genus with about 90 species (the number of species always remains disputable e.g. Gorshkova (1949), Zohary (1972) report 90 species. Baum (1966) accepts 54 species) distributed chiefly in saline areas of deserts, semideserts, steppes or on the mountains along the river and springs in Asia, Europe and N.E. Africa. In Pakistan the genus is represented by 26 taxa. 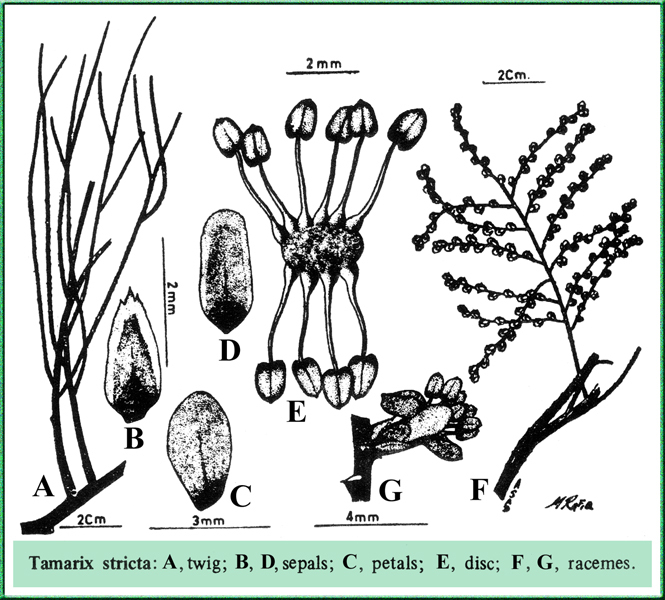 Tamarix gallica Linn., Sp. Pl. 386. 1753. This species does not occur in Indo-Pakistan subcontinent.